Rockman Corner: Neo Devroom: Vote for the Best Fan-Made Weapon Now! Neo Devroom: Vote for the Best Fan-Made Weapon Now! My apologies for not getting on this sooner -- it's be one of those weeks. 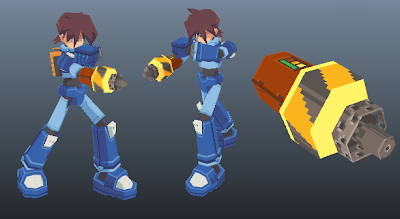 For those not in the know, The "100,000 Strong for Mega Man Legends 3" group has been holding a fan-made weapon design contest at the Neo Devroom in an effort to raise awareness for the movement. Participants submitted all sorts of concoctions, and this week we're down to the top ten designs. Now it's your turn to crown the victor. Simply head on over to the voting page and cast your vote. Be sure to check out everyone's designs, top to bottom! Voting will until April 15, so there's not too much time left. I'm digging a lot of these designs... the passion really shines through. The original Mega Man Legends 3 dev team, wherever they are, would no doubt be proud of your efforts. It's like Fantasy Football, except for game development. All of these weapons are fantastic designed!! Voted for the Velocity Buster. It seems the most well made and practical for a real game.